Till the last few days, I had never before considered the possibility that every birthday could be my last. Like many people’s, my birthday is a sensitive subject. While I hadn’t really obsessed much about my age since my 19th birthday (when I felt hit by the realization that I was leaving my childhood behind), my birthdays have become for me a symbol of appreciation and love. Or, more often (and whiningly so), the lack thereof. When the children were younger, and after my divorce, I made up my mind to treat my birthday as an opportunity to show kindness and love to others. I was disgusted by and impatient of what I considered my unhealthy habit of looking for love outside of myself. Instead, I reasoned, I would radiate love out. This brought about several years in which rather than expect gifts for myself, I shopped extensively for gifts that would bring pleasure and love for the kids. Rather than dream about waking up the morning of my birthday to my own surprise table full of gifts and treats, I decorated the house and created a surprise table for the kids. 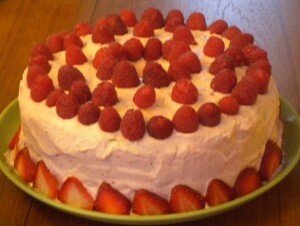 My famous angel food cake with pink clouds and strawberries, our traditional cake during all birthdays. In the last few years, however, a new factor was brought into my tenuous status-quo with this need to be loved. This factor was a new boyfriend, and one, moreover, who showed himself right from the start as considerate, thoughtful, and prone to giving gifts. On our second date (which was on a Christmas Eve), Dar showed up with a ribboned and wrapped box containing a Spot device (a device that helps locate lost hikers), the perfect gift for an avid hiker. For our third date, he showed up with chocolate-covered strawberries which he made himself (I had told him they were my favorites). For Valentine’s Day, he gave me two bouquets of flowers. One was a bouquet of pink tulips, I think. I loved that one. For my 39th birthday, Dar gave me several gifts. One, I remember, was the most elaborate box of chocolates I have ever seen. The chocolates came in a pink ruffled box that I still keep. Can you blame me if my expectations, after this beginning, reached an almost hysterical peak? Add to this my 40th birthday, the next year, which included two birthday cakes (one baked and hand-decorated by a friend’s talented daughter) and a cartoon artist who drew the guests. I think you will not wonder, then, at hearing that I consider my next three birthdays a gigantic flop. The worst, perhaps, was the birthday we spent with the kids playing badminton (they fought so much, the two of them, that I had to remove myself before I started screaming) and then having lunch at the Cheesecake Factory (the waiter and manager claimed they had nothing either wheat-free or dairy-free they could bring me to eat, and I spent the meal food-less watching the others eat). I’m not sure this birthday is going to be all that different, except, perhaps, in my own mind. The gifts for my three important people are already piling up in a secret location in the bedroom. I’ve also decided to decorate the house — I deserve it, after all, just as much as they do. I’ve made a reservation for fondue at a restaurant which pretty much we all like. What is different, however, is my acute realization that this birthday might very well be my last. Of course, any birthday might be our last. The not-knowing the day of our death is built-in, unquestionably present every moment we are alive. For all I know, my last birthday may have been my 43rd — after all, like all of us, I am not really assured of surviving till February 20th, 2017 — I am only committing to live till then as though that day is my last. But if this coming birthday is the last birthday I am going to celebrate, I would like to give myself the gift of at least some of the time celebrating it the way I’d like. On Wednesday next week, in honor of my 44th birthday, I have taken the day off, and I am going to head up to my most beloved park to check out the wildflowers. I haven’t been up there in a long time, and I’m eager to revisit my favorite spots. In a five-hour hike, I will not be able to cover all thousands of acres of park, so many of which I know like the back of my hand, but I will be able to get a taste of wilderness. Later that day, we will go to fondue, and it will either be great, or it won’t. But in any case, the success of the dinner will not matter in the way it usually does, because I will have already celebrated my birthday for myself earlier that day in the park I love.